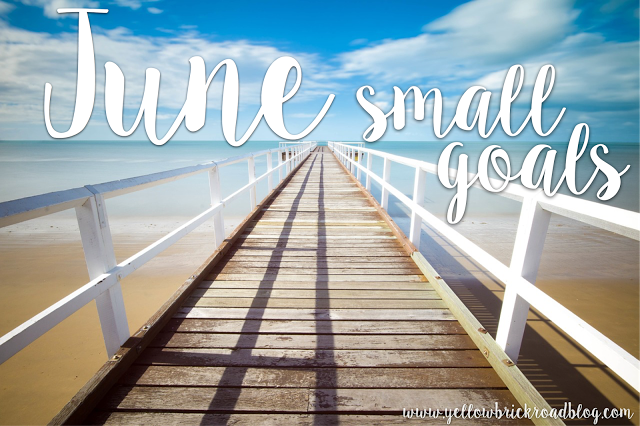 Another month, another chance to reflect and set goals! I'm linking up with Jennifer at The Yellow Brick Road again to share my small goals for this month. Click on the picture to go check out what other bloggers are planning for the month ahead and get motivated! My whole building has been very focused on improving the social / emotional climate in our school this year, and I think it has paid off. We are in a much better place than we were a year ago. Still many of our little people are emotionally fragile and needy, and although they don't always express it in the most positive ways, many of them are not looking forward to summer (especially the ones on free lunch). My goals is to not just survive the last couple of weeks of school but to show as much grace to my kids and my colleagues as possible. Oh boy, this may be a bit ambitious but I am going to put it out there. After moving at the end of November, I did a pretty good job (if I do say so myself) getting things sorted and unpacked while still in the middle of all of the busyness of school. The biggest remaining pile of unpacked boxes is sitting in my bedroom, and I am determined to tackle it as soon as school gets out! I decided when I moved into the new house that I wanted my room to be a haven, not a dump, so this cleanup is a top priority. Well I think that's it! I'd love to hear your small goals for the upcoming month: leave a comment below or, if you're a blogger, write a post yourself and go link up with Jennifer too! Happy summer!